MAPS. They hardly sound like a booming industry that will answer our economic woes, but geospatial information is a multi-million-euro enterprise. Ordnance Survey Ireland (OSi) revealed the sector contributes €69m to the Irish economy in gross added value, with the figure jumping to over €120m when multiplier impacts are included. Aerial imagery, height information, boundary lines, and even historic, tourist and leisure maps all fall under the field that employs 1,677 people – and spends €84.4m on wages. And the industry expanded significantly in recent years with the growth in smartphones, digitalisation and location-based services bringing geospatial information into the consumer mainstream. Route planners, sat navs, Google maps, GPS, real-time information and apps all rely on the basics from Ireland's national mapping agency. "Geospatial information puts the 'where' into business decisions – where to find customers, to locate premises, to build property, infrastructure and networks," said OSi chief executive Colin Bray. OSi has been mapping Ireland in detail since 1824, when it took more than 2,000 people to do it. Today, computers produce them quickly in digital form – with staff in Dublin working closely with Google and other multi-nationals. The data relates to the physical location and names of objects or businesses and, when broken down, is used in agriculture, transport, manufacturing, retail and utilities. Back home, central government and local authorities need it across all departments from planning to revenue collection. But every day, thousands of us unconsciously use it when looking online for the whereabouts of a restaurant or school, when figuring out how to get from A to B, and when planning leisure, tourism and retail trips. The economic value or annual time saving generated through the use of maps is estimated to be almost €280m – €94m a year for private car users and €185m for commercial vehicle users – including lower fuel costs. Utility companies also rely on up-to-date maps, rating its importance at 81pc. The OSI study – called Assessment to the Economic Value of the Geospatial Information Industry in Ireland – was prepared by Indecon International Economic Consultants and is the first ever assessment of the economic value of geospatial information in Ireland. Overall, it found the sector generated sales or output valued at €117.5m in 2012 and indirectly supported the employment of more than 3,000 people. 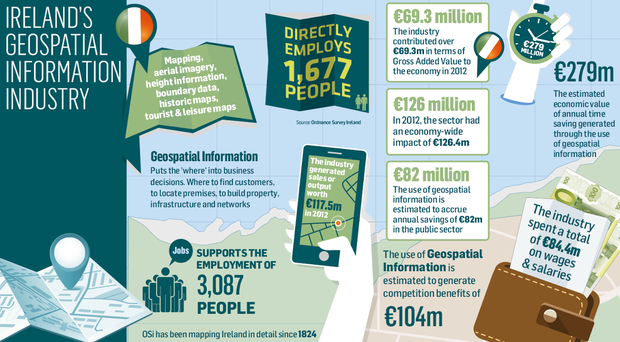 The use of geospatial information also accrues annual savings of €82m in the public sector and competition benefits of €104m, the report found. "Of particular significance are the efficiencies and savings geospatial information can provide for the public sector," Mr Bray continued, referring to the Government's plan to cut costs in its Public Service Reform Plan. OSi maintains the work it does enables other bodies and companies do what they do – with the industry set to continue expanding with the emergence of new technology. "There is potential for the geospatial supply industry in Ireland to expand and to develop enhanced export earnings," the report concluded.